Pros: tres bon ssd,tres perfomant. Thank you for purchasing the Crucial MX500 and for your review. The temperature that you are seeing is well within the range that this drive is able to run at. This drive can operate clear up to 70 degrees Celsius before it will start to throttle itself down. To see lower temperatures with your SSD, we would recommend that you improve the airflow in the system that this drive is installed in. If you have any further questions or concerns with the temperature, we ask that you contact us directly using the information that I have provided below. We look forward to hearing from you. Pros: Promise of 2 to 3 business days with Premier membership. Cons: NewEgg service is now poor compared to how excellent it used to be. The SSD was ordered on 1-2-19. Delivery was set at Saturday 1-5-19. Now, it's not expected to arrive until 1-8-19. That's more than 2 to 3 business days. Azon Prime gets me SSD's in two days, not six. They even deliver on Sunday. NewEgg doesn't consider Saturday or Sunday as work days. I'm disappointed in the degradation of NewEgg's service over the past year. I've been a customer since they were born. I am not renewing my Premier membership as it is now a waste of money. Shame on you NewEgg for letting yourself go downhill. Other Thoughts: The product is great. NewEgg isn't paying attention to customer service like it should be. 13 out of 46 people found this review helpful. Did you? Other Thoughts: I bought an older Crucial SSD model for a build a couple years ago and liked the performance. So when it was time to do some upgrades on my parents computers, I went with Crucial again, and bought 2. One accepted a Windows backup image from a dying spin drive, and dropped boot time from 3 minutes down to 30 seconds. The other went into a new build with a fresh OS install. Boot time is also around 30 seconds. 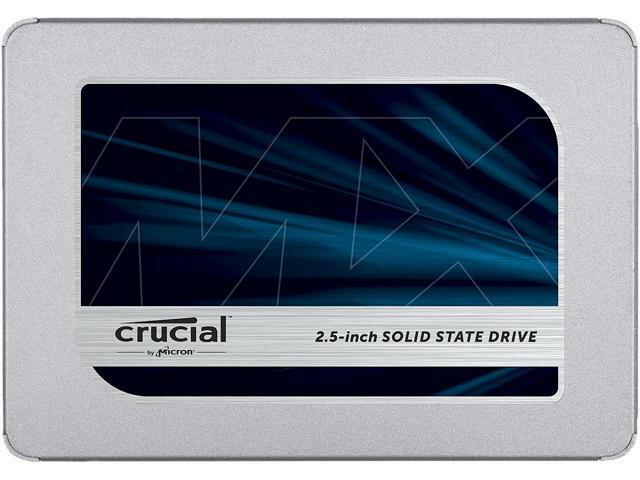 When it comes time to replace my own SSD, this will be my first choice. My older laptop was showing it's age in how slow it would boot. I put in some new RAM (maxed out what was supported) and copied the HDD over to another one of these. Once again, I am pleased with how well these SSD drives perform, and how they breathe life back into older machines. Cons: You should probably buy a 500g drive instead of 256. 500g from Crucial is a fine choice. Other Thoughts: Found out about this product from reading Anandtech's solid state recommendations. This is one of my go to drives when replacing slow HDDs with SSD. You really can't go wrong when replacing a SATA HDD with this unit. I have bought the drives a bit on the small side just because they are for company use that will never need more capacity. Get a 500g for yourself for home use. - Fast speeds for the price paid for! Other Thoughts: There are no cons at all, only pro. I only use it for one week so far with zero issues thus far. Thank you crucial! Other Thoughts: If this stopped working because whatever of reason, I’m going to buy a different brand like the Samsung ssd.